When Did "Grandma" Become a Bad Word? Growing up, I had two grandmothers. I called them "Grandma Faris" and "Grandma Capps." I think they probably told my parents that's what they wanted to be called, but I can't be 100 percent sure about that. Flash forward 30 years. All around me are Nanas and Mee-Maws and Mimis and CeeCees. In other words, everything but grandmas. A few weeks ago on Facebook, I saw one woman ask another what her "grandmother name" would be. That was the first time I realized that's a thing now. Someone gets pregnant and grandmas start working. They even visit sites that suggest grandma names. USA Today suggested it's a Baby Boomer trend. 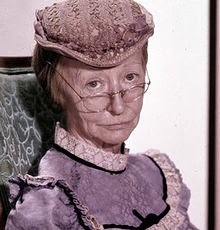 The large number of Boomers who began becoming grandmothers 20 years ago or so didn't want the stigma of being known as "Grandma" or "Granny" because when they heard the term, they had visions of grannies like the one on The Beverly Hillbillies. Not surprisingly, it's primarily a female thing. Among those who choose trendy names once a grandchild is born, 41 percent are women while only 28 percent are men. Are you a grandparent? If so, what name did you choose?